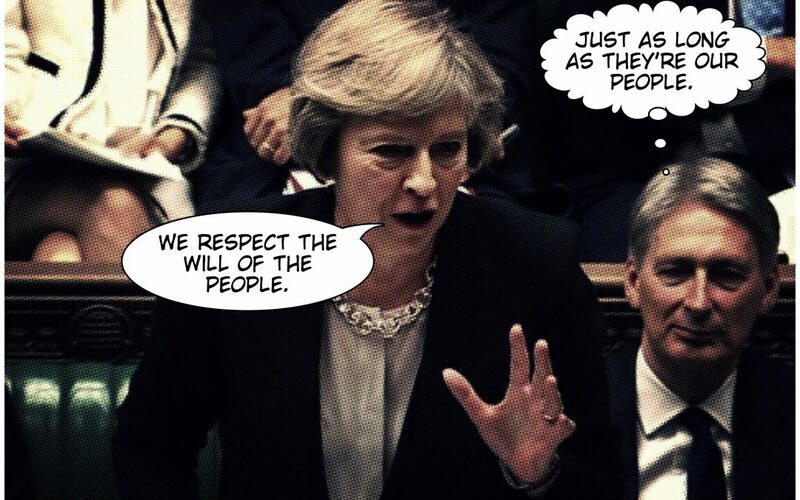 Please can someone release the phrase “the will of the British people” from being held hostage by the right wing for use as a ‘one size fits all’ slogan to dismiss any anti-Brexit argument they don’t like. 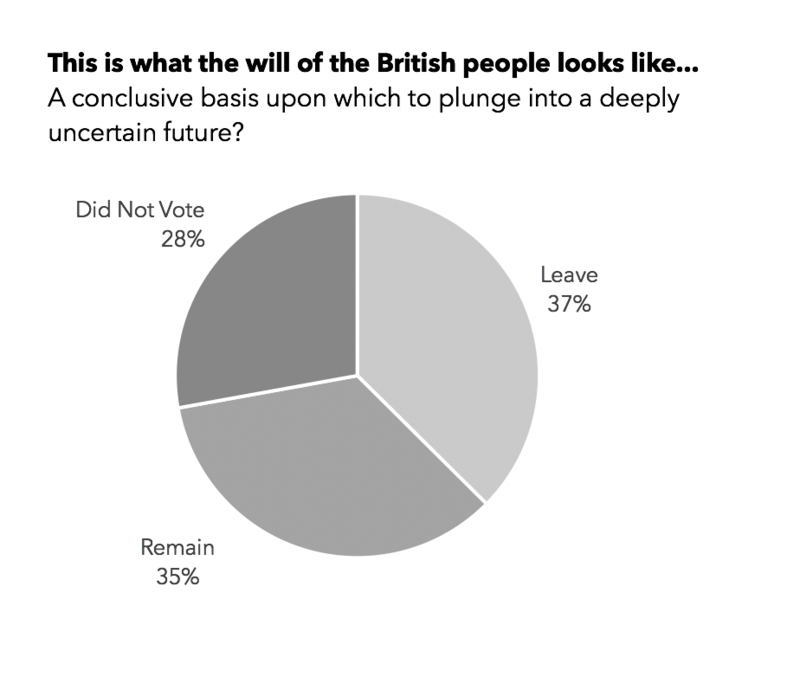 52% of the 36% of people who voted does not, and never will amount to the will of the people and that’s even before we get into the details of Scotland, Northern Ireland, London voting to stay. The chart shows the three segments of the electorate split by Leave, Remain, Did Not Vote. However hard you try, Leavers, you can’t reasonably claim any result this close reflects the will of the people. Even if Remain had won, I’d freely admit my side would have just as big a problem in claiming bragging rights – unfinished business as Nigel calls it. That’s why Cameron’s approach to the referendum was a piece of political ineptitude for the ages; no government should ever commit to such colossal constitutional change on so fine a margin. Let’s not forget, one vote either way would theoretically have been enough. And yet, on such a slender sliver of intent, we attempt to balance the future weight of history! In my professional life, if I went to my executive board with a proposal to abandon our existing business strategy, though they might consider the discussion, they would certainly ask for evidence as to why I thought this was a good idea and a summary of the benefits and likely impacts. And were I to offer them a) a pie chart showing a three way split between customers saying “do it”, customers saying “don’t do it” and a third saying “we don’t know”, b) a risk assessment based on nothing more than my own hunches (who needs experts), I’d be looking for a new job by Monday morning. No responsible person would bet their livelihood on such a flaky proposition. But a nation? Sure, bring it on. Herein lies the big issue with our ‘democratic process’. Without robust protections, such as a supermajority threshold, referenda are little more than opinion polls, “Russian roulette for republics” as Kenneth Rogoff (former chief economist of the IMF) described them. Even Margaret Thatcher, who could hardly be described as an EU sympathiser referred to them as “a device of dictators and demagogues”. As an exercise in populism, they permit just about anyone to claim centre stage if they have enough character, or more pertinently, cash to do so. And so we have a movement which will irrevocably change Britain in ways that no one can be certain, funded by unaccountable millionaire businessmen like Aaron Banks and dominated by charismatic fringe politicians, such as Nigel Farage, who are never remotely likely to lead a government. Worse, these unelected voices have greatest influence over an older audience that is the least likely to live long enough to see the consequences of this policy unfurl. Can there be anything more selfish and unfair than a 75 year old pensioner yelling ‘I want my country back’ in the face of a 25 year old care worker who has voted to remain in the European Union? 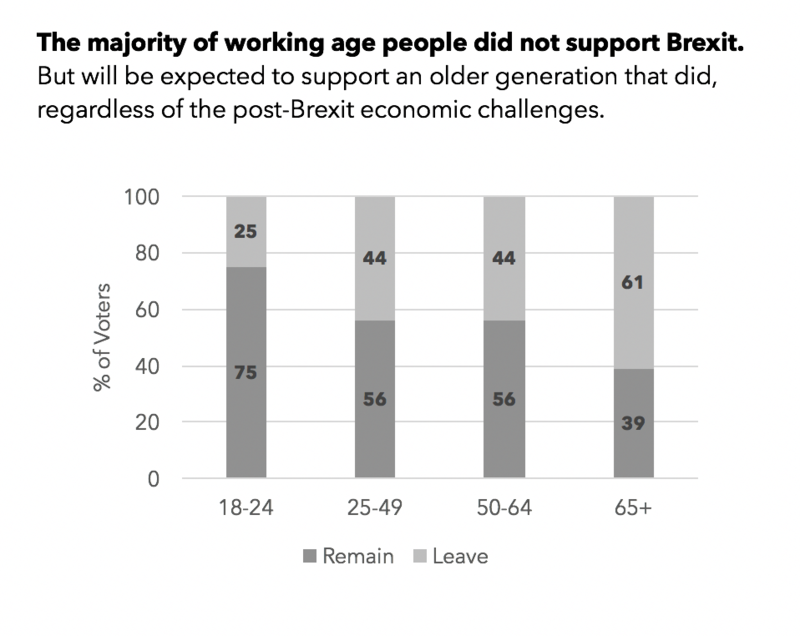 There is no getting away from the fact that Brexit is a policy overwhelmingly supported by the elderly but rejected by the young. Not so much will of the people as wilful neglect. And a tragedy for our country that I’m convinced will divide and disrupt the nation for years to come.